It often happens, it’s not the first time that I hear it, that someone starts out as a whisky lover (maybe turning in the meanwhile into a Malt Maniac) and then gradually develops love for all things Scottish… Well, almost all, as haggis and black pudding can still be a bit scary even for the most die-hard Scotland lovers. All this until summer 2006: I had been thinking of visiting Scotland for the past years, but I had always chosen other destinations. Egypt, Morocco, Tunisia, Kenya, Austria, Czech Republic… Nice places, some of them actually stunning, but still no Scotland! The main obstacle was probably my wife Silvia, not so intrigued by the idea of a coldish place, with lots of rain and wind (which she heartily hates), and by the reports of horrible food and uncomfortable places to sleep made by some friends of ours (yeah, right, read on…). Anyway I won her reluctance, with the important “persuasion” help of a couple of friends (Gianluca and Cinzia) who were thrilled by the idea. The first three days of our summer trip were spent in London. That was because that’s where EasyJet flights from Torino arrive in the UK. After these three days, we took another EasyJet flight to Glasgow, where we had planned to spend the night at the Holiday Inn in front of the airport before starting our trip on a rented car the next morning. Bad move! In spite of having already paid in advance when we had made our reservation, we were told by the hotel manager that our room had been given to another guest because of overbooking! Quite damn scandalous, if you ask me… and not a good start for a vacation. If this is Scottish hospitality, we are screwed, we thought… but luckily that was only a glitch because the rest of the vacation proved to be much better, thanks to MUCH nicer people than the pricks at Glasgow Airport Holiday Inn. Anyway, the hotel manager sent us for the night to another place not very far from the airport (The Dumbuck House), which luckily was very nice. Extra “maltophile” points: on the road to the hotel, we passed by Auchentoshan and Ballantines. Some sleep, a nice breakfast (just some tea, marmalade and toasts… we shocked many “locales” during our vacation by saying no to bacon, eggs, sausages and all sort of things which would have instantly killed our delicate mediterranean stomachs so early in the morning…), and here we go, ready to hit the road! 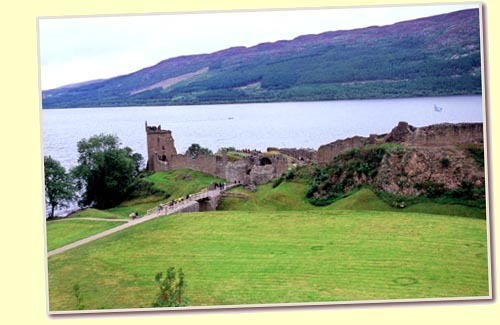 The first town of a certain importance that we stopped at was Inveraray, to have a look at the beautiful castle, at the old jail and at the town. I loved Inveraray, a very quiet place on a sea loch with a nice relaxed atmosphere. In general, I loved these sea lochs: there is the sea, there are constantly seagulls making noise, you can truly breathe sea air… but all around it’s full of mountains, a view which is quite unusual for us. 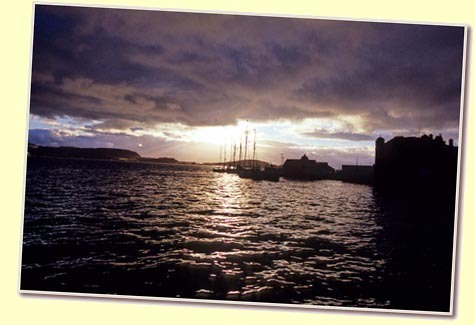 Oban is another sea port which I guess lives of tourism and fishing… and of course the distillery. We only visited the outside and the shop because it was too late, but it was nice. By the way, if you happen to stay in Oban just beware of the wind: it’s one of the places in which it blew stronger and colder (yes, more angry looks from my wife!) during our vacation. Off we go to Fort William! Again, Fort William is a nice coastal town, with a nice atmosphere: the main street has a bit too many tourist shops, but as a whole it’s not bad at all. By the way, this was the place where we bought a newspaper and read about the terrorists’ failed attempts to bomb planes in London the day before (phew, we were VERY lucky to have left before!) and about the new restrictions for luggage on flights (no liquids, etc.). Which meant two bad things for me: that I risked to have my heavy camera gear put as checked baggage, and that I could probably not carry any precious bottle back to Italy. Oh, well, nowadays with Internet I can buy them from home and have them delivered… so this didn’t spoil my vacation too much. Mallaig looks even more like a fisherman’s den than all the other coastal places we had seen so far: as such, it offers very little touristic attractions and can grow a bit boring after an hour, but it certainly looked much more authentic. While waiting for the ferry, we also saw a glimpse of the Isle of Mull from a distance: maybe another trip to Scotland in the future? Why not, since I recently tasted a killer sherried expression of Tobermory from Wilson & Morgan and I would like to know more of this distillery! The brief cruise to Skye was enjoyable (although the wind at sea was starting to be a bit TOO much even for me who I usually don’t care much for it), and we found Skye at its best… bathed in a beautiful golden sunset light. The vast open spaces of Skye are eye-popping no matter where you look at, definitely the best I have seen in Scotland! Too bad it was very late so we had to rush to our B&B and to have dinner, because in certain areas of Scotland restaurants stop serving food at 9 PM and we were quite hungry! In finding a good place we were helped by the ENORMOUSLY kind Mrs. Gillian Glenwright of the White Heather Hotel (in Kyleakin) where we had made our reservation: she made a phone call to a restaurant she knew and booked the last table for us! By the way, coming back to the “uncomfortable places to sleep” topic: we didn’t find ANY place to sleep in Scotland that was any less than GOOD, and most of them EXCELLENT. Either we were lucky, or we picked well when making our reservations… or simply the level of B&Bs and hotels in Scotland is quite high, with extremely gentle hosts. We have to say that White Heather was one of the best: lovely large rooms, with a great care for cleanliness and the minute details that DO matter, and a nice breakfast. Well done, Gillian! And so, after leaving our luggage at White Heather, again we rushed out for dinner to the recommended place: Creelers, just a few minutes from Kyleakin. And here we come to the other scary topic: the “bad food”. Ha! Again, we never found a place where the food was bad: even in the remotest pub of Scotland, we enjoyed it! Of course you have to like meat, fish and potatoes and forget about vegetarian stuff and of course pasta (but in a couple of place we had some nice salads and lasagne too! ), but I am certainly not complaining. Almost anywhere you can find battered haddock and ale steak pie, not to mention some good “soup of the day” made with tasty ingredients like onions, bacon, leek and cheddar: and this should quench the hunger and satisfy the senses… Anyway Creelers on Skye was certainly a notch above most other places: great assortment of fresh fish cooked in intriguing ways, and other seafood. And, very important, the first meeting with the yummy black chocolate fudge cake which became a must at the end of so many dinners! Comment: A bold and interesting expression from this often overlooked distillery. Too bad it didn’t get any medals at the Awards, because I absolutely loved it. Sadly the next day on Skye didn’t offer light and weather as beautiful as the evening of our arrival: mist, some drops of rain and a bleak atmosphere. The impact was still beautiful and impressive, anyway. First thing to do in the morning was of course the visit at the Talisker distillery: set in a very remote and isolated corner of the island, in Carbost at a few feet from the shores of a sea loch, the distillery absolutely doesn’t look like the place where one of the best-known and appreciated single malts in the world comes from. And yet it is , thanks to the quality of the whisky (though I will stress that old bottlings had more character) and the powerful marketing of Diageo. As soon as you enter the white building, it’s immediately evident that the drinks giant has turned even a remote distillery like this one into a tourist attraction. Which of course also means that it looks a bit too modern at times… Anyway, we leisurely enjoyed our dram of Talisker 10 when we waited for the tour to start: also Gianluca tried one, but he almost choked on it because he found it too smokey (you haven’t tried the real smoky stuff, my friend… now I plan to slip an unexpected Lagavulin 12 or Ardbeg Very Young under his nose the first time he comes to my house!) and so I finished his glass too. After Talisker we headed for Dunvegan Castle, another “must” of every tour of Scotland: the castle of the MacLeod clan! Nice interiors and gardens, a worthwhile visit. Then we headed for Portree, while crossing the whole island of Skye and admiring its striking landscape. 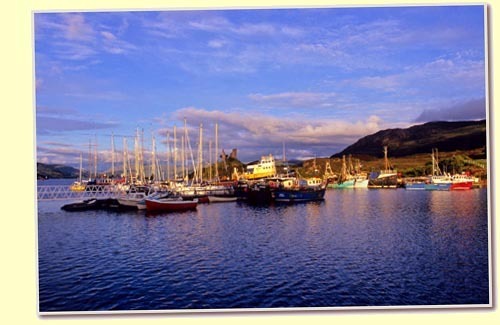 Portree is another coastal town with its nice atmosphere, lots of seagulls, vividly colored houses, etc. etc. A brief tour of the town, some photos, and then off to the northern part of the island which is very sparsely inhabited. Just lots of green hills, some rocky formations (including the famous Old Man of Storr), beautiful cliffs and LOTS of sheep. A very enjoyable afternoon, a memorable experience for the eyes. But our day on Skye had to come to an end, so we took the bridge at Kyleakin and crossed back to the mainland heading for Kyle of Lochalsh. Any movie buff will recognize the next attraction, the Eilean Donan Castle, very renowned for being the castle shown in the film “Highlander” with Christopher Lambert (WTF? A French guy pretending to be a Scottish warrior, while the supreme Sean Connery pretends he’s a noble Spanish swordsman???? Oh, whatever…). The castle was closed for visits as it was late in the afternoon, but we spent quite a lot of time around its walls enjoying the view. 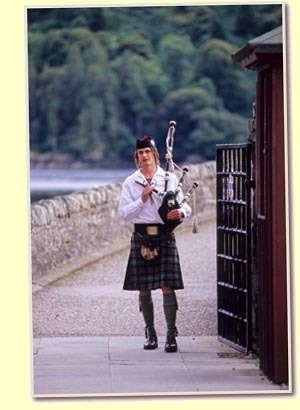 And, stroke of luck, we stumbled into a local marriage which was to be celebrated inside the castle: we had a chance to see lots of men with skirts… ehm, with kilts, and the official piper for the ceremony surely added LOTS of atmosphere. You certainly can’t get any better with all these stereotypes in one shot: kilts, piper, castle, typical landscape… We enjoyed it all VERY much… Also my wife was starting to like the place, after all, which was a big satisfaction! By the way, if you happen in the Skye/Kyle of Lochalsh/Eilean Donan area, don’t miss the local beers which are available almost anywhere: Red Cuillin, Black Cuillin and Hebridean Gold. I found them all very pleasant, especially the red one. Early morning departure for Loch Ness, under a gray sky. First stop was Fort Augustus, a place of interest because of the sluices that allow boats to enter Loch Ness from the canal in spite of the different altitude level (a bit like Panama… on a smaller scale). At lunch time we were in Inverness, but we decided to drive a few miles eastwards more to visit Cawdor Castle and have something to eat at the nearby tavern. Cawdor Castle is quite huge and well preserved: the interior is lavish and fascinating, though of course visitors are only allowed to see a small part of the rooms (don’t forget that many Scottish castles are still inhabited). 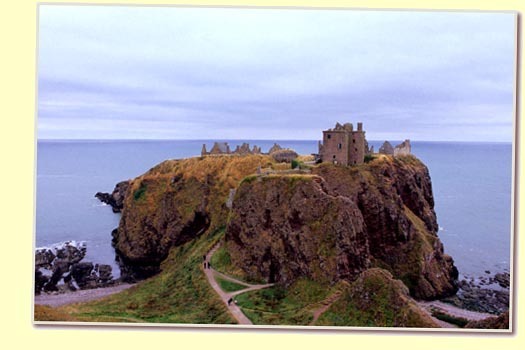 The funny thing is that this castle is linked to Macbeth due to Shakespeare’s play… but it’s just artistic license, since at the time of Macbeth and Duncan’s murder the castle had not been built yet! Another colorful note: in a shop we saw the perfect “good taste” souvenir to bring back to friends… the McCondom Whisky Flavored condoms, packed in an elegant tartan-colored little box… Ouch! I still wonder whether they are flavored with a blend or a single malt… Some tasting notes and a Matrix score would be interesting… but I prefer to pass this task to someone else than being seen sucking a condom! Compared to more recent versions, it smells “dirtier” (in a pleasant way) and more organic. Palate: Good balance of sweetness and dryness. Very sherried, intense and fruity (peach, mango, orange, raspberry, cassis). A bit viscous. One of the most overpoweringly sherried malts I have ever had, and one of the best examples of how sherry maturation must be done: it’s huge, but not excessive. Not the almost metallic sherry character some other distilleries have, not excessively mouth-drying. Only Glengoyne and Aberlour can consistently make sherried malts this good, IMHO. Comment: Sherry cancels almost any maltiness, but it’s extremely enjoyable (though a bit unidimensional). The fifth day was meant to be a relaxing one: some nice drive in the countryside, and a couple of stop at distilleries. Right, because we were about to enter the region of Speyside, where you stumble into a distillery every step you take (and I am not joking… you really needn’t look hard, because the road signs point everywhere). Next Maniacal stop was at Glen Grant: coming from Italy, what did you expect? 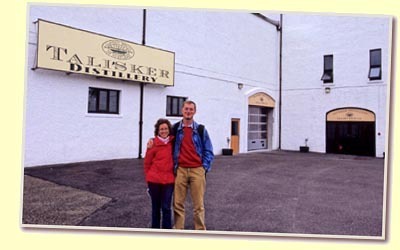 The tour was very nice and friendly (not to mention FREE), and the bonus was seeing all of the rooms 100% in operation (while at Talisker there was no distillation in that particular moment). Again, that wonderful smell of fermenting barley, and some good laughs provided by the cute girl who showed us around (“The spent barley after fermentation is transformed in pellets which are used to feed the cattle… and that’s why in Scotland we have very happy cows!!!”). Overall a very nice and friendly place, although they only have the regular NAS and 10yo bottlings to taste and to buy, because as the girl explained to me all the casks destined to a longer maturation are sent to Gordon & MacPhail in Rothes. 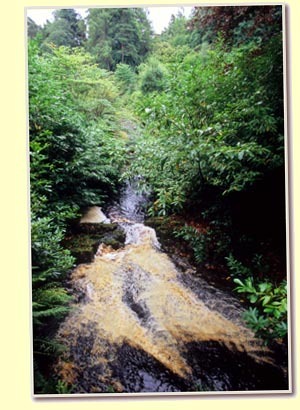 By the way, Glen Grant is the place where we saw the brownest and peatiest water in all of Scotland: the creek which runs through the Victorian gardens and is used by the distillery has a color that could be easily mistaken for slightly diluted Coca Cola!!! Funny how the Glen Grant malts don’t have even the slightest taste of peat, another proof (if needed) that using highly peated water for the wort does not lead to a peated final product. Before dinner we also managed to visit the nearby Fraser Castle, which is interesting because it’s a bit in the French style, quite different from the other ones in the area. While not many rooms are open for visits, the ones that are surely deserve a look. For dinner we went to another quiet country hamlet called Monymusk: at the Grant Arms Hotel we had very good food, and the whisky selection at the bar is nice and absolutely honestly-priced. I picked a delicious 15yo full proof Glenlivet from an old-looking bottle which ended my day perfectly. Nose: Still a bit spirity like the 5yo Italian version, but evidently “better” (less pear distillate smell, less grappa-like). Palate: Very clean and dry, lively but not too pungent. It’s spirity because it’s young, but it has a pleasant maltiness with slight wood, sherry and smoke notes. Delicate but not weak. Drinkable and inoffensive. Passing through Montrose, we then headed for Brechin for the night; actually we arrived early in the afternoon because we had miscalculated the driving times… and it was quite disappointing because Brechin is NOT what I would call an attractive place. Shops close at 5PM, and after that time it looks a bit like a ghost town: very few people around, gray stone buildings, and the dull weather sure did not help. The fact that the local distillery (North Port) is mothballed certainly doesn’t help. Palate: Again, big sweetness with or without water. It’s like a honey and propolis liqueur! Also a bit like Drambuie. The fact that it was the childhood home of the Queen Mother, of Princess Margaret and, again, that it was quoted in the Shakespeare play “Macbeth” surely adds to the atmosphere. No, we didn’t see any ghost, though the castle is also famous for legends of this kind (actually more than half of the castles we’ve seen were supposed to have some kind of ghost wandering in their rooms… I guess that they are quite pissed off by the tourists who disturb they sleep and they don’t show up in revenge). Next stop was Dundee, where we passed rather quickly and just had a glance at the Discovery ship in the harbor: we had to hurry a bit because we wanted to reach St. Andrews, the place with the oldest golf course in Scotland. St. Andrews is a nice but VERY touristic place, sort of a “holiday resort” for rich guys who love golf. After a nice and quite cheap lunch at the Doll’s House restaurant in the center, and a big laugh in front of a barber shop (due to a “FREE DRAM WITH EVERY HAIRCUT!” sign on the door!) we had a walk in the town and headed for the beautiful Cathedral: huge, impressive… although in ruins. The fact that it looks so old and crumbled to stones is actually fascinating: we spent quite a long time enjoying the view and walking among the gravestones. After a quick look at the local castle, at another church and the renowned university, and then some boring shopping by the girls for tartan rugs, scarfs and the like (I forgot to mention that it was NOT the first day in which they indulged in their shopping activities while Gianluca and I stayed outside for a cigarette…), we then headed towards Perth for the night. Perth is a nice and quite modern town, and the Dunallan guest house was yet another excellent place to stay. Under suggestion from the guys at Dunallan, we went to eat at Paco’s, which while not serving only typically Scottish food was truly excellent. Palate: Syrupy, warm. A nice sherry maturation: intense and luscious, but not markedly winey or astringent character. The distillate is not overwhelmed by the wood: it is a nice interplay between maltiness and sherry. Notes of licorice, chestnuts and dried fruits, “Barolo chinato”. Comment: Another winning bottle from the “luxury” selection of W&M! 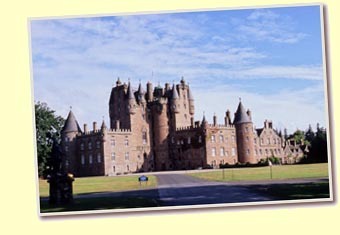 First thing in the morning, we headed just outside of Perth to see the Scone Palace. It’s the crowning place of Macbeth (this time not in fiction, but in history!) and many Scottish kings. The interiors of this castle are among the most lavish we’ve seen (although, again, few rooms are open to the public) and the park outside is very elegant and relaxing. After this visit, we then headed towards Stirling to see its castle. Actually this time we’re not speaking of a family estate like most castles in Scotland are: this is a true, big fortification on the top of a hill, more a “castle complex” that betrays its ancient use as military base. As such, the visit takes quite a long time and covers several buildings. The informative value of the visit is high, although of course the castle has been heavily restored and adapted as tourist attraction (though the same can be said of most Scottish castles): in some rooms you can even see recreations of life in the castle with statues showing the daily activities (the preparation of food, etc). 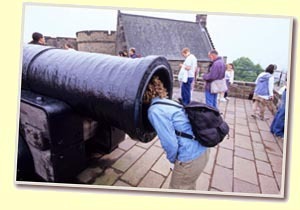 Being an old military fortification, don’t expect lavish furniture and tapestries, but walking around and seeing the weapons exhibitions, the wall perimeter, the cannons and all the stuff is surely interesting and a welcome change of pace. From the top of the hill on which the castle stands (precisely, from the point where there’s the statue of legendary king Robert the Bruce), you can also have a nice view of the Wallace Monument on top of another hill… which of course was destined to be our next stop. Since I suppose you’ve all done your homework and seen “Braveheart”, you already know who Wallace is. 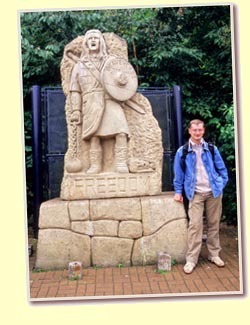 If you don’t, shame on you and learn at least that he fought for the rights of his fellow Scotsmen: he died by the hand of the English, but his name still remains. The monument lies on top of a steep rock, and it’s quite impressive: it looks like a tower from the “Lord of the Rings” movie, and it hosts an interesting historical exposition about the life of the Scottish hero. Nose: Extremely dry and pungent, with lots of nuts of every kind, freshly cut grass. Almost “crisp”, if you get the idea… like the breezy mountain air in the woods in a chilly morning. Palate: Very intense, not as “friendly” as some other commercial bottlings of this price range. Dry sherry attack, followed by orangey notes and again a grassy profile. A different style of sherry wood than other bottlings in this E-pistle! Quite austere in its dryness, almost mouth -drying. Wood polish, some hints of propolis, dry like a Fino… yet also rich like an Oloroso. This day was the worst of all weather-wise: rain pouring over us from 10 AM, and this was a shame because we had to see Edinburgh… After battling with the heavy morning traffic of this large city (it was Festival time, so lots of tourists), we reached the Edinburgh Castle: again, like in Stirling, this is not only a castle, but a fortified complex, although more modern. Visiting all takes AT LEAST a couple of hours: the crown jewels, the military exhibitions (depicting uniforms and weaponry of Scottish troops from various centuries), etc. and is definitely a worthwhile visit. After lunch at the Scotch Whisky Heritage Center (where I also had a nice Bowmore Dusk to prevent a rain-induced cold), we started walking on the “Royal Mile”, the old central street of Edinburgh where you can find historical buildings, tartan shops and weavers, well-furnished single malt stores, a confectionery specialized in fudge (but their hot chocolate was not excellent, in spite of the owners being of Italian origins), the Parliament, a huge cathedral where the most striking attraction is the famous Thistle Chapel with its intricate ceiling, and the Holyrood House. In spite of the heavy rain, the crowd attracted by the Festival was big (mimes, actors, clowns, musicians…) and I would suggest another period rather than August if you want to visit the town with a more relaxed atmosphere. Nose: A very faint whiff of peat is masked by the luscious wine finish. Sweet, raisiny, with raspberry and iodine making a nice interplay. Some darker brooding “burnt” notes. No violets or lavender, luckily! Palate: Fruity, syrupy, nutty. The wine, again, wins over the distillery character but it’s not as unbalanced and wild as in some Darkest batches. Rubbered bandages, rose-water, a good balance of sweetness and dryness. Comment: An interesting wine finish that for once doesn’t taste “funny”. I am not a big fan of recent Bowmores, but this one was very nice (not complex, but rounded, pleasant and without any evident fault). Dunfermline House is right in front of the ruins of Melrose Abbey: yes, again a huge old building crumbled to stones but actually in a much better shape than the one in St Andrews. 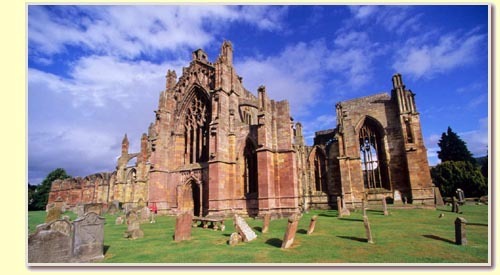 It’s really a beautiful place, with lots of interesting visuals and of course of great historical importance as the heart of Robert the Bruce is buried in the Abbey grounds. Not very far from Melrose is Abbotsford, of interest because of the beautiful home of famous writer Walter Scott: it is in very good conditions, with excellent interiors which can be freely photographed (the only place we’ve visited where there were no restrictions about this!) including Scott’s desk where he used to write his epic novels. After Abbotsford, the last place we had to visit was Roslyn Chapel… a must for anyone who enjoyed “The DaVinci Code”. It actually isn’t as mysterious and atmospheric as the book would suggest: crowded with tourists, and covered by an ugly-looking scaffolding to preserve it from humidity. Anyway, the Masonic symbols are all there and you can have fun exploring all the little details if you are into this sort of stuff… I am not, and I just shot lots of pictures for the girls who wanted to be sure to bring back home every minute detail… But then it was time to leave, so we headed for Edinburgh Airport: due to the terrorist threat, some dumb restrictions on hand luggage still applied, so I had one hell of a time managing to bring my heavy and large (and FRAGILE) camera equipment on board with me… but I eventually succeeded. The funny thing is that while the airport personnel was very strict about the size of my backpack, they almost didn’t even take a look at the CONTENTS when I finally managed to squeeze it into the maximum required size… Come on folks, less stupid size limitations and more controls on the nature of items INSIDE the bags!!! The trip could hardly have been any better (hoping for more days of sun and blue skies would have been pure illusion: at least we didn’t suffer much cold or rain), and even my ultra-skeptical wife was extremely satisfied. Now she also asks where a single malt comes from whenever she sips a little bit from my glass at home! To finish, just let me give a couple of suggestions to the Scottish: first, please stop trying to serve single malts in tumblers! Except for my dram at the Heritage Center in Edinburgh (where the barman obviously was very knowledgeable), I always had to ask specifically for a proper tasting glass… often receiving quizzical looks from the bartenders. Second, why in 99% of the places in Scotland (and also England) do the sinks have separate taps for hot and cold water? Definitely a big nuisance… Wake up, the rest of the world has discovered “mixers” so that you don’t have to choose between scorching your hands with boiling water or freezing them! (And I would also like to know the purpose of the “inflatable sheep” that were available at the condom dispenser in the toilets of many pubs… but I feel that I’d probably better leave that question unasked…).